Language Stars – in action again. Nine intrepid language stars worked hard to prepare for the Routes into Languages public speaking event on Tuesday 18th March. Having seen footage of previous winners it was with some trepidation that we set off to compete in this event. 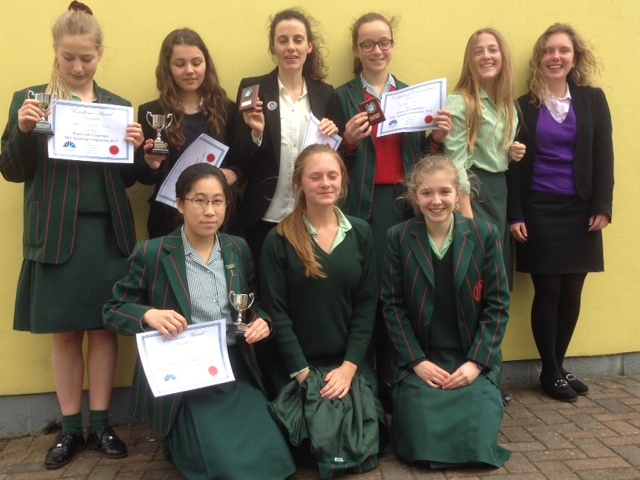 However, we need not have worried as all the girls performed brilliantly and demonstrated both good linguistic skills and good knowledge of their chosen topic areas. Gwen started off in the KS3 non-native speaker event with a very polished performance about her town. Alice followed in French on a similar theme. Alex, quite possibly the youngest person in the event gave a very detailed, slick and confident performance in the near-native speaker event. In KS4 non-native speaker event Alyx shone. She learnt a great deal from watching the performances that had come before hers and she really spoke with great emphasis, enthusiasm and intonation. Her talk was about a holiday but it was certainly a holiday with a difference! It was a shame that India and Hetty were in the same category because only one of them could get a prize but they both deserved a medal. India’s enthusiastic presentation about Simón Bolívar was delivered with real aplomb. India obviously loved her topic and it was this that gave her the runner-up medal above Hetty’s presentation on Brigitte Bardot. In all, a great day. The girls can be really proud of themselves. We certainly are!